High-resolution displays provide a rich visual experience, allowing users to see sharper text and more details in photos than on standard-resolution displays. The high-resolution model for OS X is based on Quartz. Introduced in OS X v10.0, Quartz allows developers to draw into an abstract coordinate space—user space—without regard for the characteristics of the final drawing destination: printer, screen, bitmap, PDF. The OS X implementation of high resolution extends this flexible imaging model throughout the system, to the level of the display. When you run a high-resolution-savvy app on a high-resolution device, the text, vector drawing, and UI controls are sharp. This is due to the increased pixel density—pixels are smaller and there are more of them per unit area. Each point in user space is backed by four pixels. The increase in pixel density results in higher details for drawing and text rendering. 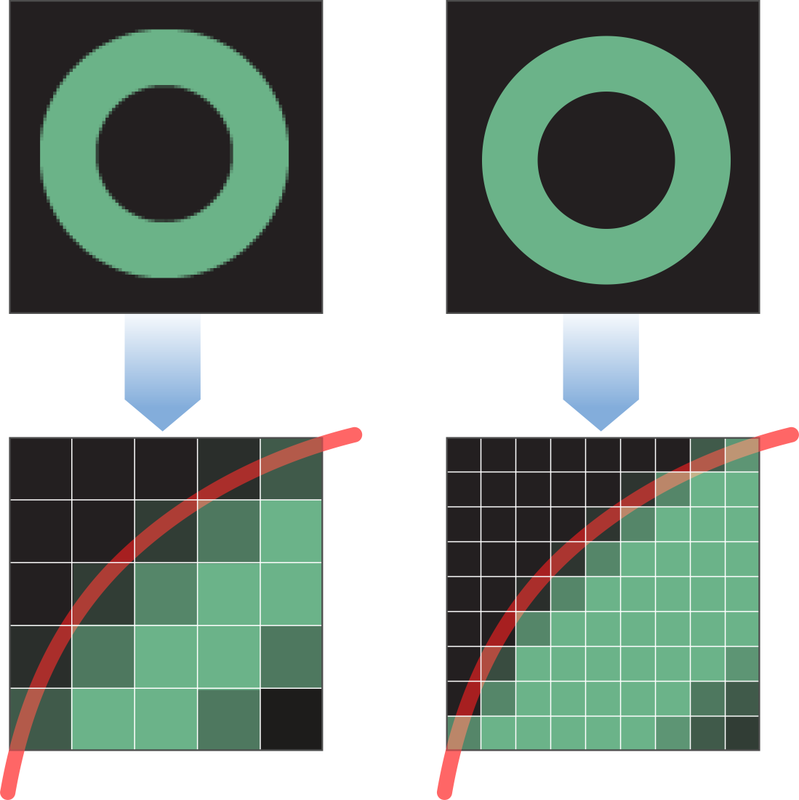 As shown in Figure I-1, a standard-resolution display has fewer pixels available to approximate the shape of a curve, resulting in a jagged look when magnified. But a high-resolution display has quadruple the pixels available to approximate the curve, resulting in a much smoother-looking curve. Magnified or not, when you look at the same shape on a standard-resolution display and a high-resolution one, the difference is obvious immediately. The guidelines in this document describe how to optimize your app for high resolution. At the core of most guidelines in this document is that you should think in points most of the time, but understand the exceptions when you must be aware of pixels. You’ll need to free your code from relying on device coordinates, except in perhaps the most extreme edge cases. You’ll also need to increase the resolution of all the graphics resources your app uses. OS X does much of the work required to handle the different resolutions, but there are some tasks you must perform, such as providing specially named high-resolution images and updating icon assets. You’ll also need to update your code to use the most recent APIs, especially in cases where you are currently using deprecated APIs. If your app uses pixel-based technologies (such as OpenGL, Quartz image patterns), needs low-level access to display information, must examine pixels directly, or supports other specialized tasks or technologies, you’ll need to perform some work to ensure your app works well in high resolution. At the very least, scan through the list of advanced techniques to see which ones, if any, apply to your app. You don’t need a high-resolution display to start optimizing your app and testing the code. Quartz Debug has features you can use to make sure your app is working as expected. When things don’t work as expected, the troubleshooting section can help you figure out the issue. If you aren’t able to update your app immediately for high resolution, it’s important to understand how users will experience your app as they wait for you to release the optimized version. OS X Human Interface Guidelines provides advice on designing high-resolution artwork for app icons. Cocoa Drawing Guide provides important conceptual information for understanding drawing and image handling. It also contains numerous examples that show how to use AppKit drawing technologies.